EEEEE!! OMG...you guys...Stef, from Sarcastic Cooking, is gonna have a BABY BOY!! I'm baby obsessed (seriously ask anyone, I ADORE babies. If I see your photos of your baby on facebook or instagram...that just like...makes my day. I fully intend to have a bunch of little ones myself someday and I just love em!) and Stef obsessed, for that matter, so when Stephie (my girl from Eat Your Heart Out) asked if I wanted to join in on a virtual baby shower for Stef, I immediately said YES! Food bloggers (or maybe just bloggers in general) are weird creatures. I know that. Nobody outside understands. I tell them I'm a part of a virtual baby shower and they're like "...so...they don't actually get to eat the food you're making for them?" and I'm like "well...no...but it's in spirit...just..ya know...ugh you don't get it." It's a thing though, ok? Just trust it is our way of saying WE LOVE YOU to our bloggy buds! This is Stef and her husband Mike's first child, and I am just so psyched for them. I honestly can't even imagine how overwhelming and exciting this time must be for them! Stef seems totally cool as a cucumber though, and I know she's gonna make an amazing mom. When trying to brainstorm ideas for what to make for this post, I asked Stephie for any ideas, if Stef was craving anything in particular, etc. etc. and she mostly just said she's been a pickle fiend. Which of course made me think of the old pregnant woman stereotype of pickles and ice cream. And I figured well...if she's gonna eat her pickles, she might as well enjoy some spectacular ice cream as well, right? So I asked Stephie if she thought Stef would like the idea of salted caramel ice cream to which she responded, and I quote, "That's gonna get a resounding YES YUM ALL THE CARAMEL ICE CREAM THINGS response from her, haha!" So...there ya have it. 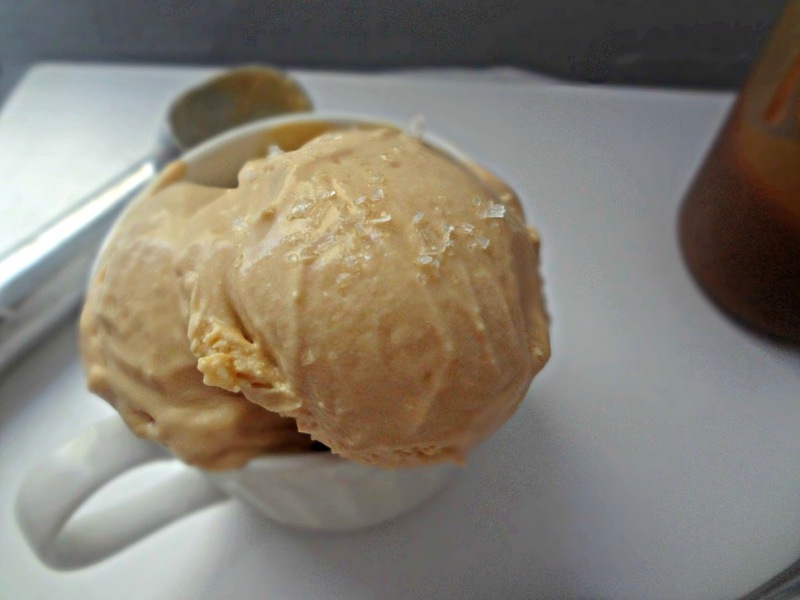 And, BONUS, since I'm sure Stef is busy preparing to be a mom, and will be even busier BEING a mom, this ice cream recipe is the no ice cream maker method. 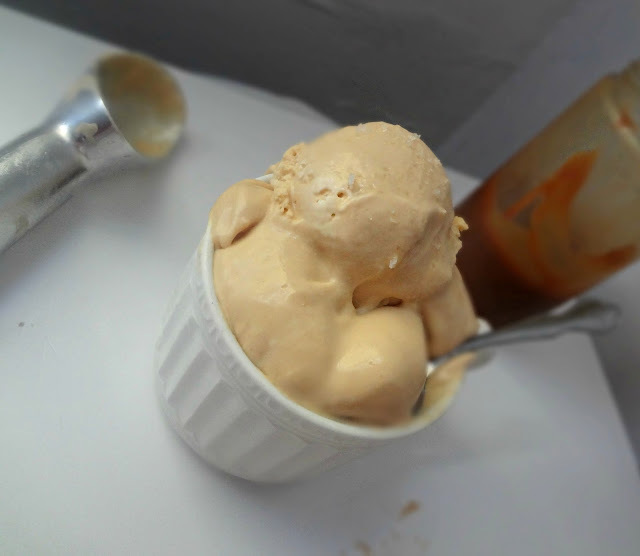 Which is the super easy, super quick way of making ice cream that I am addicted to! 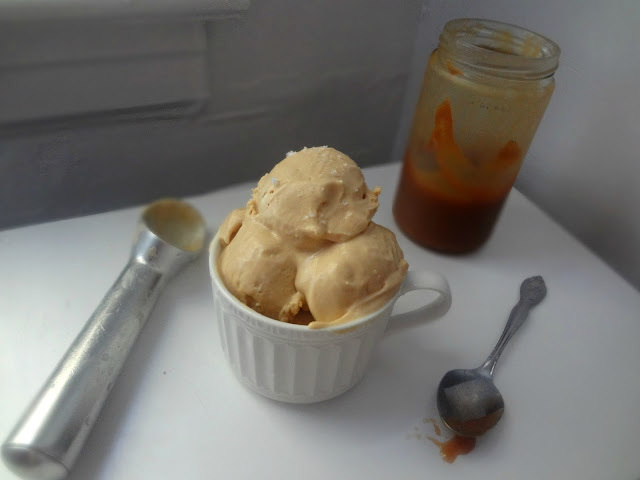 And we all remember that amazing salted caramel sauce recipe I shared on Monday? 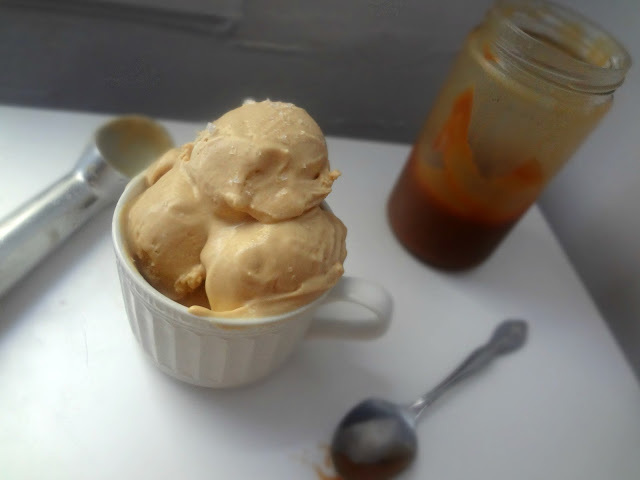 Yeah this ice cream tastes exactly like that...but in ice cream form (although feel free to use any caramel sauce you like). So prepare for incredibly rich, delicious, salted-caramel-flavor-packed ice cream! So Stefanie, CONGRATULATIONS on your pregnancy, and your soon to be new little baby boy! I hope that all of us telling you you're amazing makes you smile, and that you want to eat your computer screen. Because of all the deliciousness we've made for you. <3!!! Check out all the posts for Stef's Virtual Baby Shower! Whisk together the caramel sauce and sweetened condensed milk. Whip heavy cream until stiff peaks form (it should be very thick). 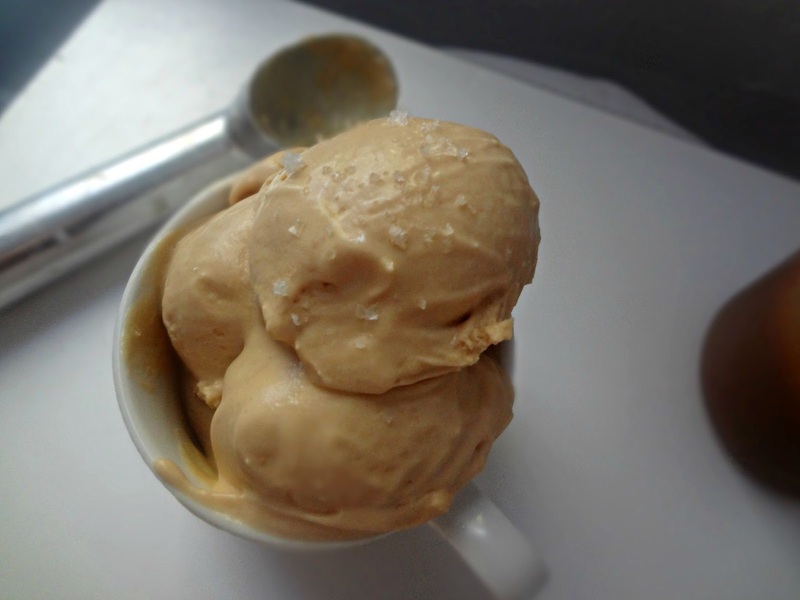 Fold whipped cream into the caramel condensed milk mixture until fully combined. Transfer to an airtight container. Sprinkle some course sea salt on top, if desired. Store in the freezer for at least 6 hours before serving. Can serve with an additional sprinkling of sea salt on top.